When we started to play with our recently acquired RC cars, Benoit's kids wanted to try them. Unfortunately the cars are too powerful and too fast for kids, they can really be dangerous for them, and they can break them, so they were a bit frustrated by our refusals. I started with some example servo code made for Arduino and placed it into an ATTINY85. I noticed there was some noise in the measure, as placing a servo on the output resulted in an unstable position. I understood that interrupt management and possibly other stuff outside the arduino's loop() were making the timing unstable. Last but not least, the code was huge and couldn't possibly fit under 1 kB for the smallest devices. But I could easily replicate the input pulse to the output. So it was time to get rid of the arduino environment and reimplement it in plain C.
The width can be converted to microseconds by multiplying/dividing it by the CPU's frequency. Care must be taken to avoid integer overflows while sticking to 16 bits. For integral MHz frequencies it's trivial. For non-integral MHz frequencies, the conversion can be done on 32 bit while keeping 16 bit values in and out. With only this done, we don't need the C++ nor arduino environment anymore and we can have a very compact C code. It worked pretty well but I realized that I couldn't brake anymore by going backwards. In fact my car brakes before trying to go backward when it was going forward, and the braking force depends on how far I pull the trigger. 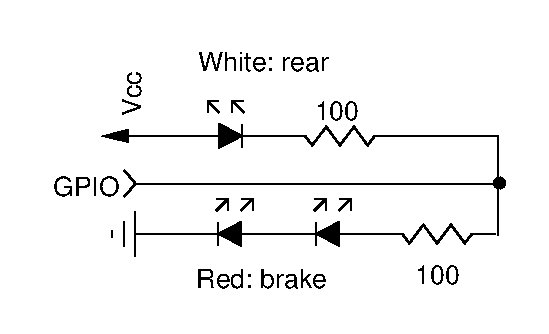 Not being able to brake is not acceptable, so I had to implement the whole ESC's state machine. the car continues to brake until the trigger is released. In order to go backward, I have to release it and pull it again. This means that after braking and releasing the trigger, it goes to rest again. 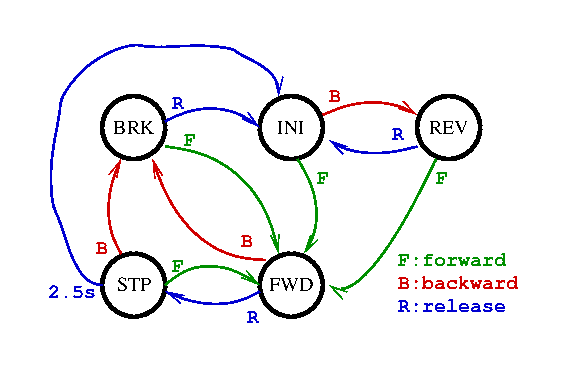 This state machine allows a different ratio to be applied to different states. The forward and backward speeds are cut in half, but the brake force is kept at full scale. I also realized that knowing the current state makes it convenient to light some LEDs to indicate what is being done. We can have a set of brake lights made of red LEDs, and a backward light made of a white LED. I found that the internal RC oscillator is not very precise so I implemented an automatic frequency adjustment at boot so that the car would not automatically start to advance or go backward. The idea is that when booting, the only signal we're supposed to see is the center position, so we average it over a few measures and compute the offset so that this one equals 1500 microseconds. This state is implemented at boot before going to the INI state. Also the LED on PB1 (pin 6) which is present on some ATTINY85 boards is used as a debugging indicator. It is lit when we're not at the rest position. This eases centering on the transmitter because the led must be turned off by default. Just similar to what was implemented from a disassembled servo a few months ago, it's possible to implement an RC switch from this controller by enabling/disabling a GPIO depending on the pulse width. So I added such a very simple test to connect to an output pin. After I realized that by implementing this on a $0.30 ATTINY13A, coupled with a $0.07 cable it could be 3 times cheaper than the previous solution, I ended up writing a simplified version of the program doing just that, called onoff.c. But the same function was implemented on its own pin on the main program so that pre-programmed chips can be use for both purposes without having to be reprogrammed. ATTINY13/85 only have 5 usable GPIO (well 6 if you reprogram the RST pin but I don't want to, it's too painful for development). 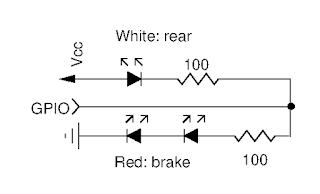 With one GPIO for the input pulse, one for the output pulse, one for the centering LED, one for the ON/OFF LED, it leaves only one pin for the brake/rear LEDs. However there's a solution to solve this. If we put 2 red LEDs and 1 white LED in series, their total voltage is around 6.6V so they will not turn on on 5V. However it's possible to light either the 2 red ones or the white one by connecting their middle pin to the power supply or ground. The only thing is that to turn them off we need to disconnect the pin, which is equivalent to configuring it for input. It will only keep the internal pull-up which will be too weak to turn the LEDs on. We could use a single resistor connected to the GPIO, but it's safer to use one per set of LED so that in the event an over voltage would appear beyond their turn-on voltage, the drained current remains limited. With all these features implemented, the code is only 642 bytes long for a 8 MHz ATTINY85, and 804 bytes long for a 9.6 MHz ATTINY13A. A simple male-to-female connector was cut to provide both the connector to the RX and the connector to the ESC. An extra 5-pin connector was added to access the LED signals. There is no additional component, only the MCU and cables. All this was enclosed in heat shrink tube and could be placed inside the receiver receptacle in the car. Some improvements could be made. First, I forgot to solder a wire to the RST pin in case I'd want to reprogram the device. Second, it would make sense to support detecting a short-circuit on one of the GPIO at boot in order to disable the throttling. It could result in sort of an adult/kid switch. For example, the debug LED GPIO could be used for this since it's only used to debug the throttling. It would also be nice to try to make the device learn the highest possible speed from the remote, but probably that it is not very easy to implement in that small code. There are only 220 bytes left on the ATTINY13A, so that's something to keep in mind. Hex code ready to be flashed is provided below. Just copy-paste it to a file and flash it as usual with avrdude after having set the fuses above.